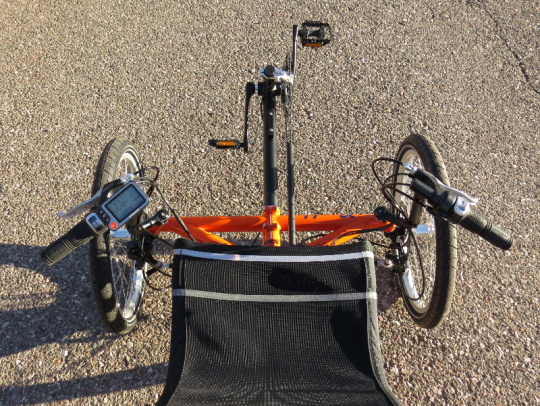 In this first part of the review there are a BUNCH of detailed pictures and specifications to get you familiar with this electric trike. The TerraTrike Rambler is priced at $1,699 and the E-BikeKit 500 watt direct drive rear hub motor with 48V 9ah lead acid battery is priced at $866. The total price is $2,565, not including shipping. Part 2 of the TerraTrike Rambler with E-BikeKit review will give you info on ride characteristics, results from the range test, pros, cons, and overall thoughts on this e-trike. Alright, let’s get into the details of the TerraTrike Rambler with E-BikeKit! The TerraTrike Rambler and the E-BikeKit conversion system unboxed and ready for assembly! This is the E-BikeKit unboxed. This particular kit has a 500 watt (peaks at 1,000 watts) direct drive rear hub motor and a 48V 9ah lead acid battery that can power a trike or bike up to 28 mph! E-BikeKit has many other kit configurations to choose from like geared hub motors and lithium ion batteries. The E-BikeKit 500 watt direct drive rear hub motor laced up on a 20″ wheel. 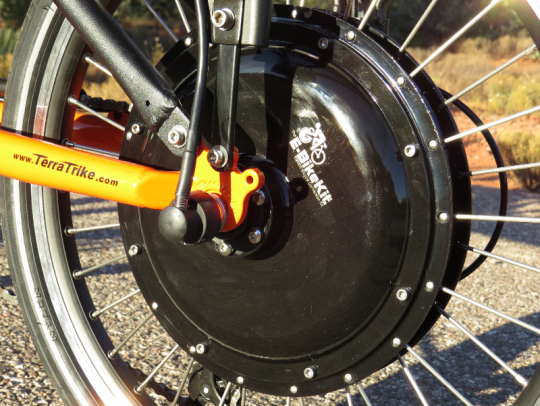 E-BikeKit offers their kits in 20″, 24″, 26″, and 29″ (700c) wheel sizes. All of their wheels are built in the USA. This kit came with a Shimano 7 speed freewheel. 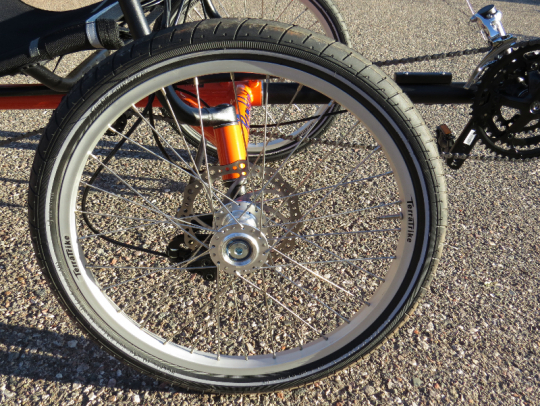 E-BikeKit will be offering 8 speed and 9 speed freewheel options soon. 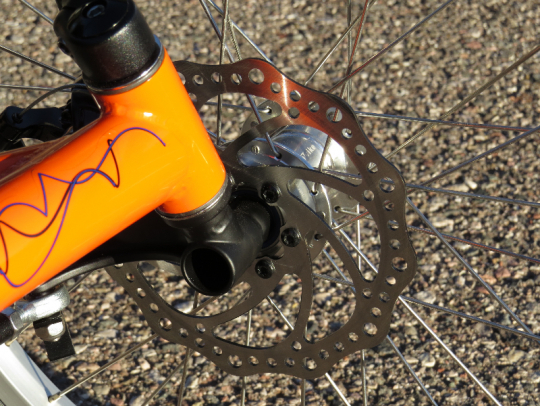 A disc brake rotor can be mounted to the E-BikeKit motor (traditional 6 bolt pattern). 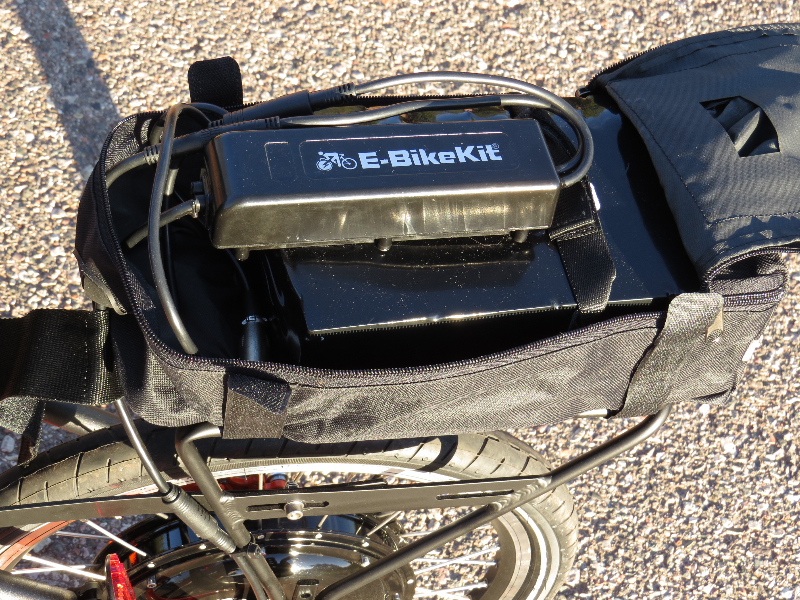 This is the E-BikeKit battery bag and charger. 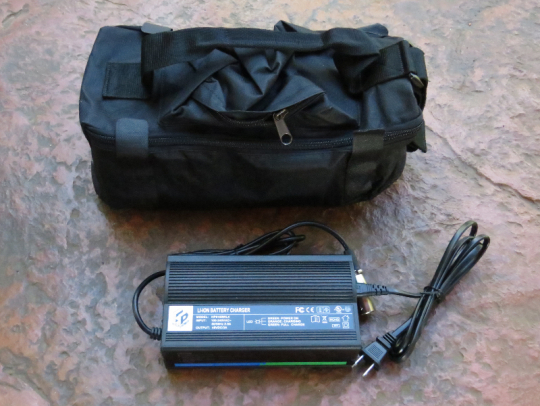 It takes about 3 hours to charge the 48V 9ah lead acid battery. The brake levers (with electronic switches to stop assist), the LCD display, 2 throttle options (twist grip or thumb throttle), and the controller. 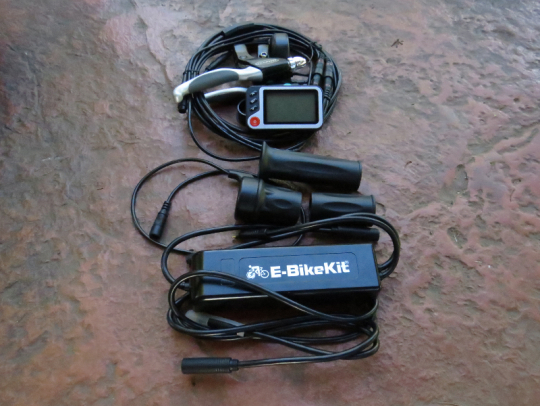 The connectors on the E-BikeKit are very easy to use and have a solid connection feel. It is nice to have the option of a thumb throttle or twist grip throttle. 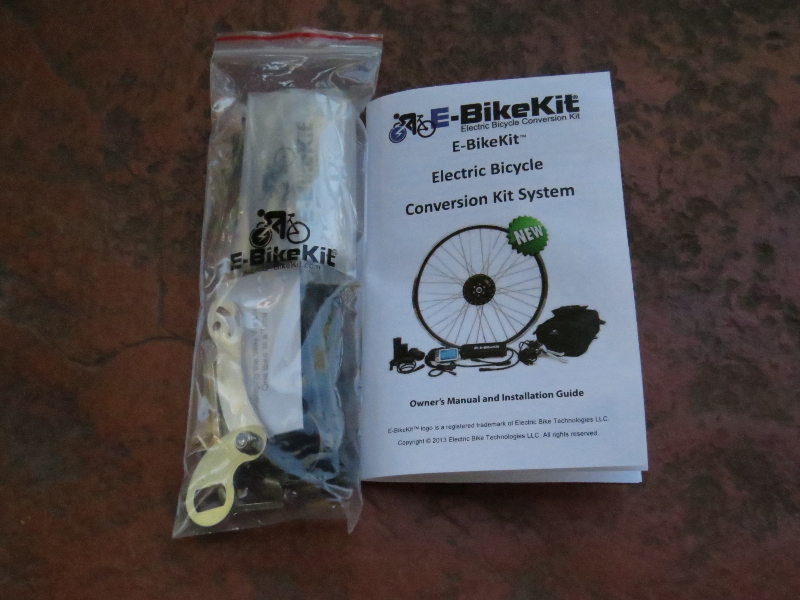 The small parts and instructions that come with the E-BikeKit. The instructions are very easy to follow and assembly is straight forward. The TerraTrike Rambler electrified with the E-BikeKit conversion system! 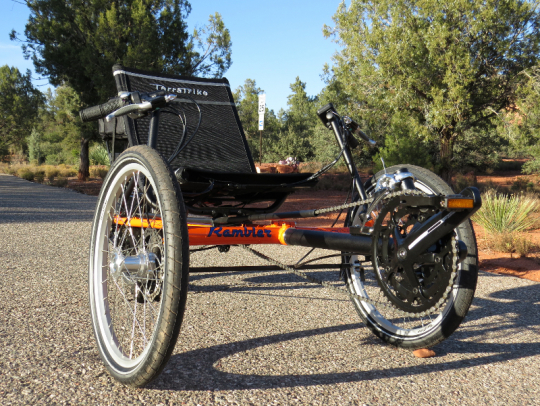 The Rambler comes in many different component configurations and TerraTrike also makes many other recumbent trike models. The Rambler is ready to roll! The battery can be mounted on the rear rack or other locations; like behind the seat. 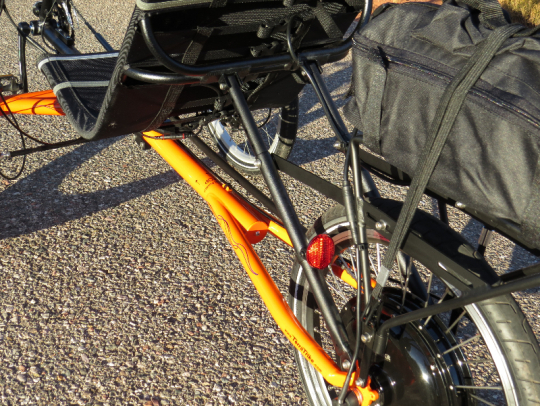 The width of the Rambler is 33″, which allows it to ride comfortably in traditional bike paths. Here is the cockpit of the Rambler. It is easy to sit down and go. Everything is pretty intuitive with steering, pedaling, shifting and braking all controlled here. The turning radius of the Rambler is very good. TerraTrike claims that in most cases it is better than an upright bicycle. 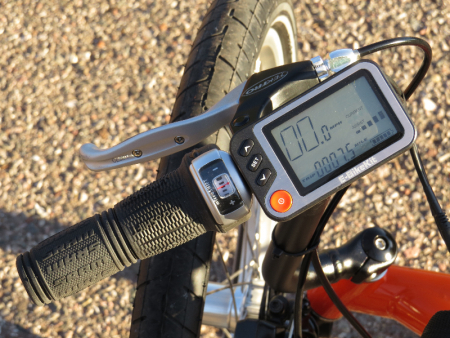 On the left handlebar there is the E-BikeKit LCD display, the front left side brake , and the front derailleur shifter. 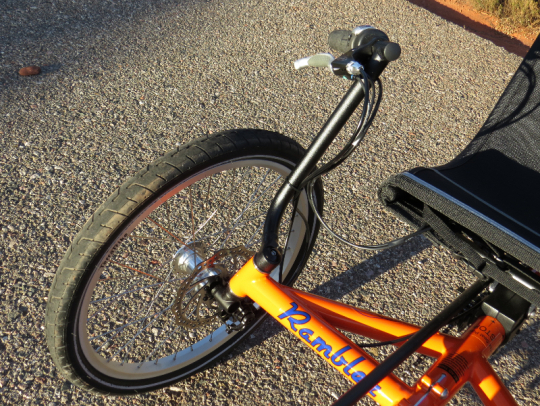 The Rambler comes stock with Promax brake levers that have a locking mechanism so that the trike won’t roll when it is parked. 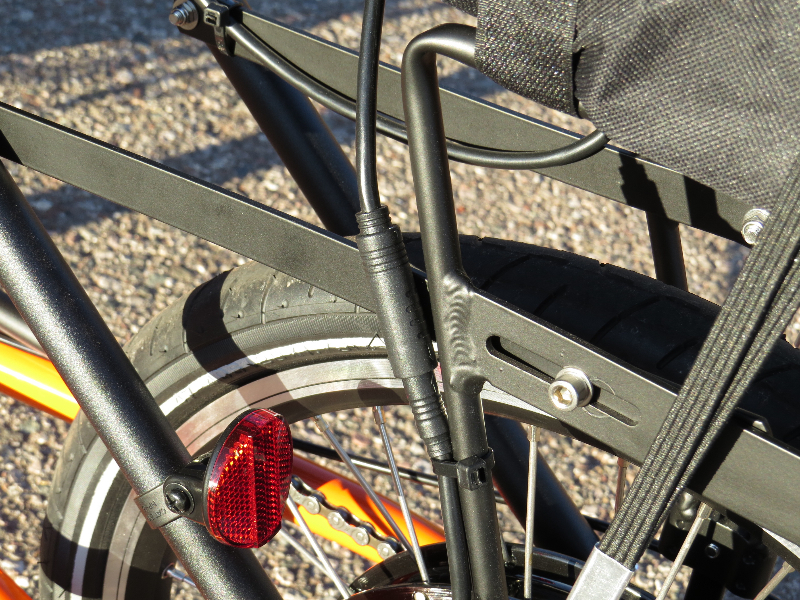 The Tektro brake levers that you see in this pictures are from the E-BikeKit and they have electronic switches that will stop the electric assist when you engage the brake levers. The LCD provides info like speed, distance (trip and overall), battery level, speed level (there are 5), and the energy draw from the battery (current). The display has a backlight for riding at night. It has an intuitive layout and it is easy to adjust the speed levels with the up and down arrows on the left side of the display. The features of the E-BikeKit LCD display. 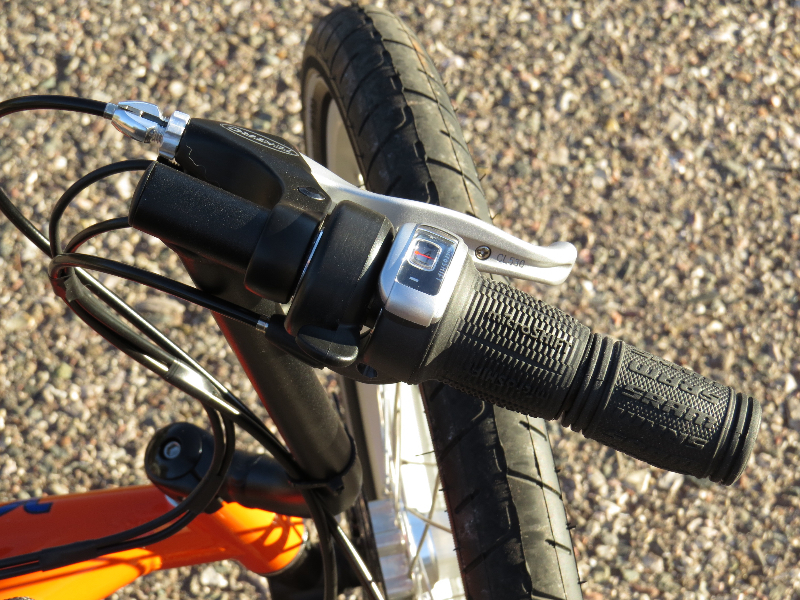 The right side of the handlebars: the E-BikeKit thumb throttle, the front right side Tektro brake lever (see comments on left handlebar picture), and the 8 speed Microshift grip shifter for the rear derailleur. Here is a view of the right handlebar. This is the FSA Tempo crankset with 3 chainrings: 30t, 42t, and 52t sizes. The aluminum boom tube (where the cranks are mounted) can be adjusted to fit you. The 20″ wheels come with CST tires that have a reflective strip that helps with visibility at night. 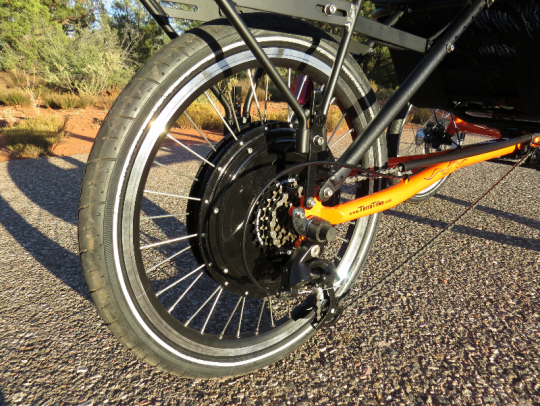 You can see the Alhonga mechanical disc brakes as well. The Rambler comes equipped with the Alhonga mechanical disc brakes on both front wheels. They do provide significant stopping power! This is the Alhonga mechanical disc brake caliper. 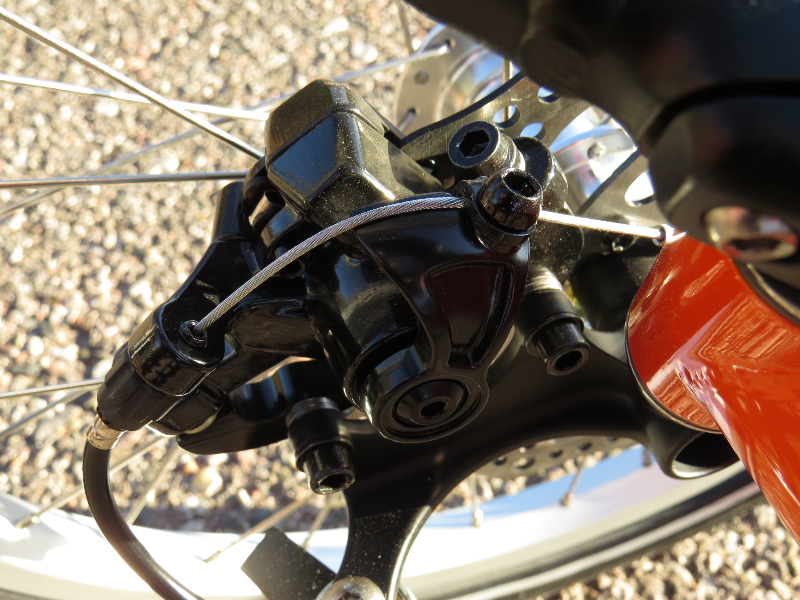 Another view of the Alhonga mechanical disc brake caliper. This is the mesh seat with aluminum frame. It is very adjustable to fit your riding style. You can adjust it forward and back as well as the angle (between 40-65 degrees). 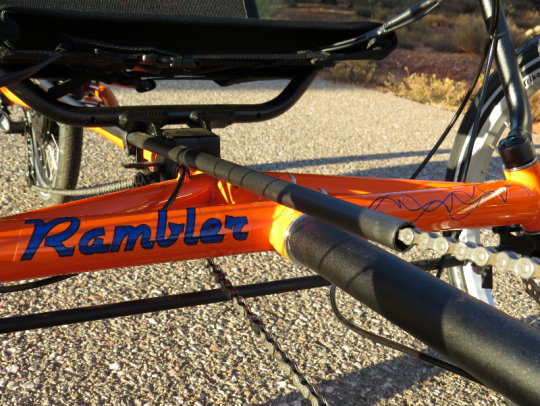 The angle of the seat on the Rambler can be adjusted between 40 and 65 degrees to fit your riding style. The seat frame is aluminum to keep the weight down. 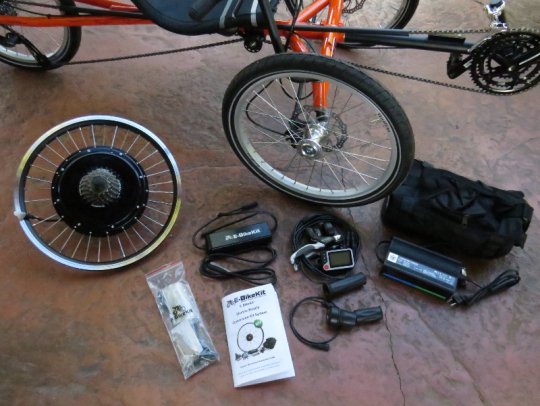 The E-BikeKit 500 watt direct drive motor that can peak up to 1,000 watts. With the 48V battery used in this review the Rambler can fly around at 28 mph! A disc brake rotor can be mounted to the E-BikeKit motor. 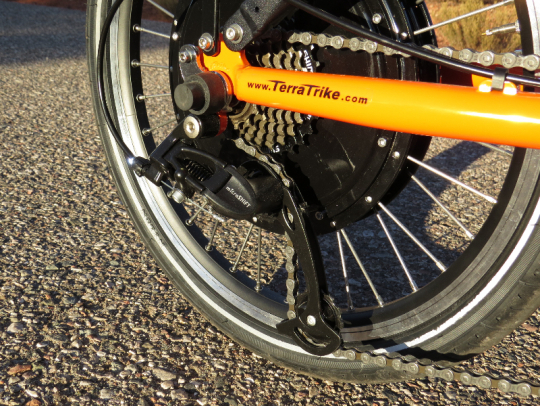 In this application there is no brake on the rear wheel of the TerraTrike Rambler. 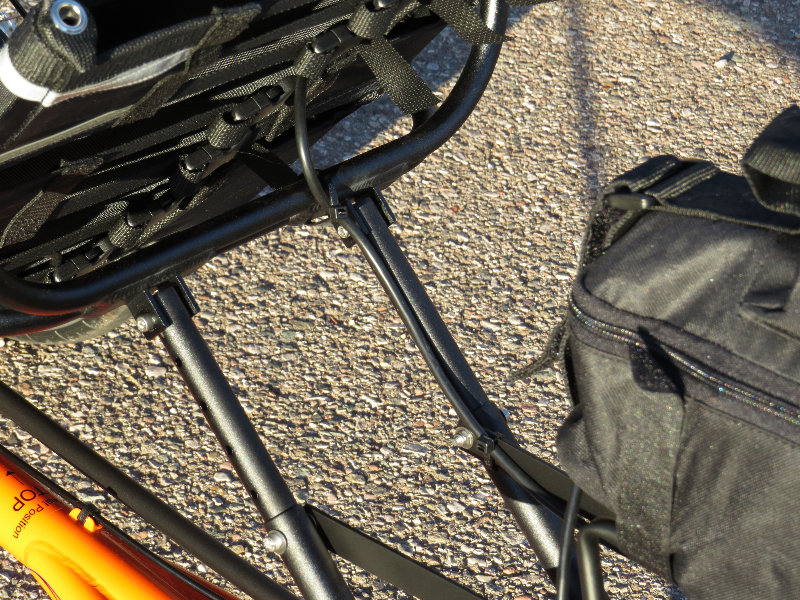 The controller and battery can be housed in the battery bag on the rear rack. The 48V 9ah lead acid battery pack. 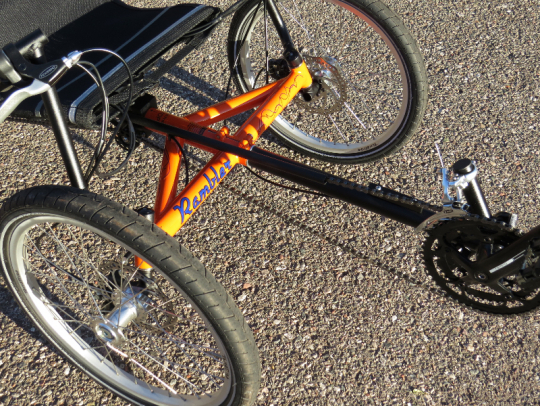 It was easy to conceal the wiring along the rack and seat struts on the TerraTrike Rambler. This is the motor connector. If you need to remove the rear wheel for changing a flat this connector can be easily separated by hand. 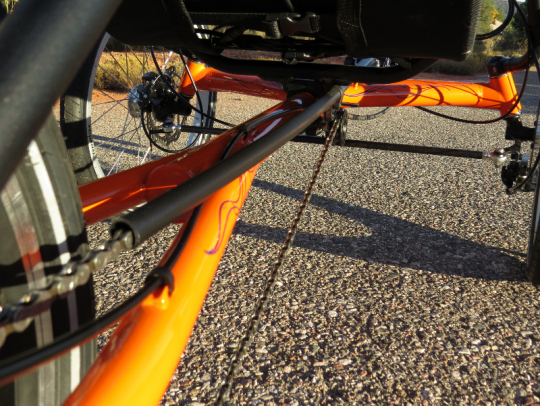 The chain guard extends under the seat back to the rear wheel area. The Rambler has a nice 4130 Chromoly steel frame and as you can see in the picture the welds look pretty good. 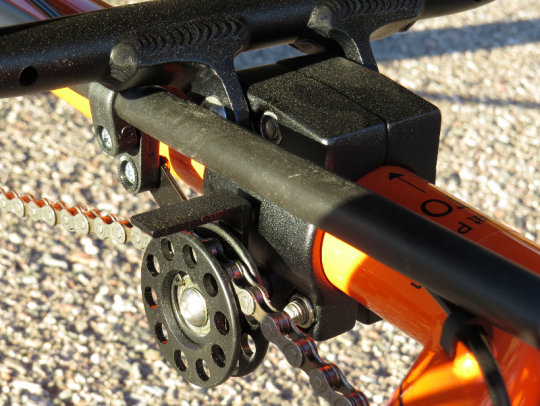 The Rambler uses this idler pulley just under the seat to keep the chain off of the ground for the derailleur versions. TerraTrike does make a Rambler version that uses a Shimano Nexus internal geared hub that does not use the idler pulley. 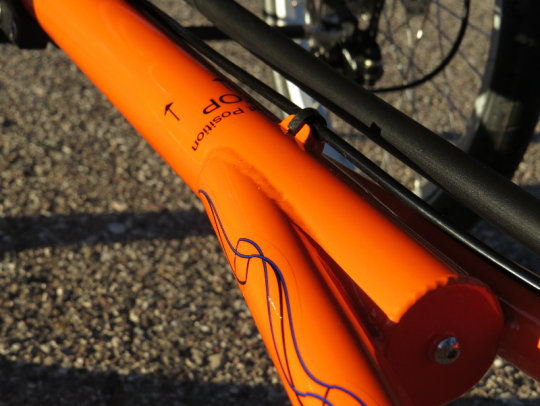 You can also see the adjustable seat seat clamp that attaches to the frame. 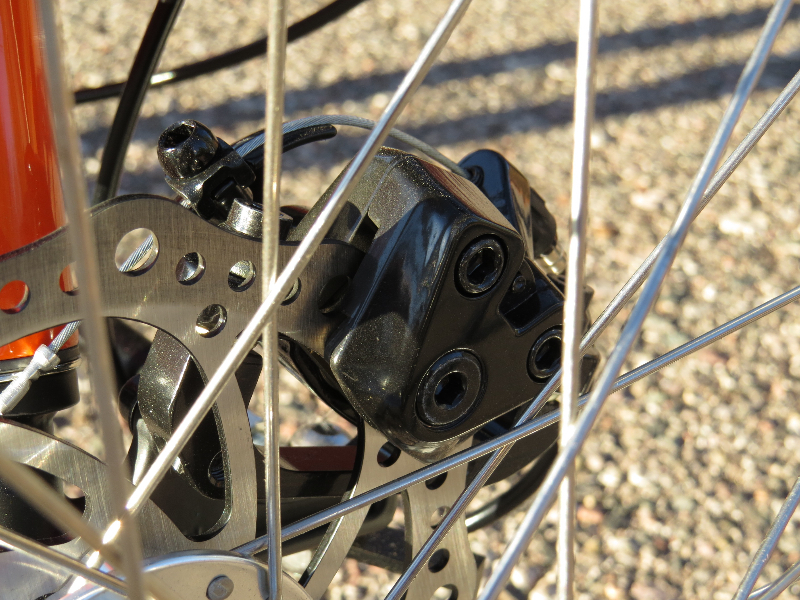 This is the Microshift rear derailleur. The Rambler comes stock with 8 speeds on the back for a total of 24 speeds when combined with the 3 chainrings on the crankset. The E-BikeKit comes stock with a 7 speed freewheel and that is what you see in this picture. 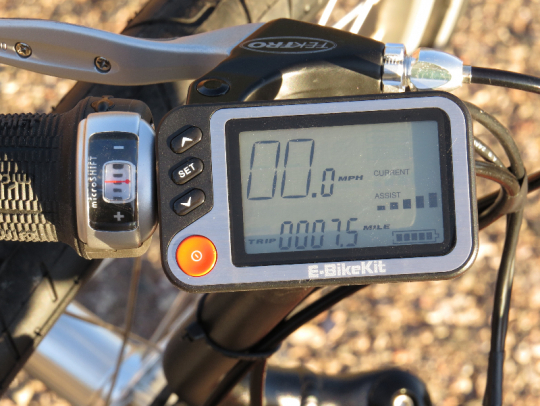 E-BikeKit will be offering 8 speed and 9 speed freewheel options soon. 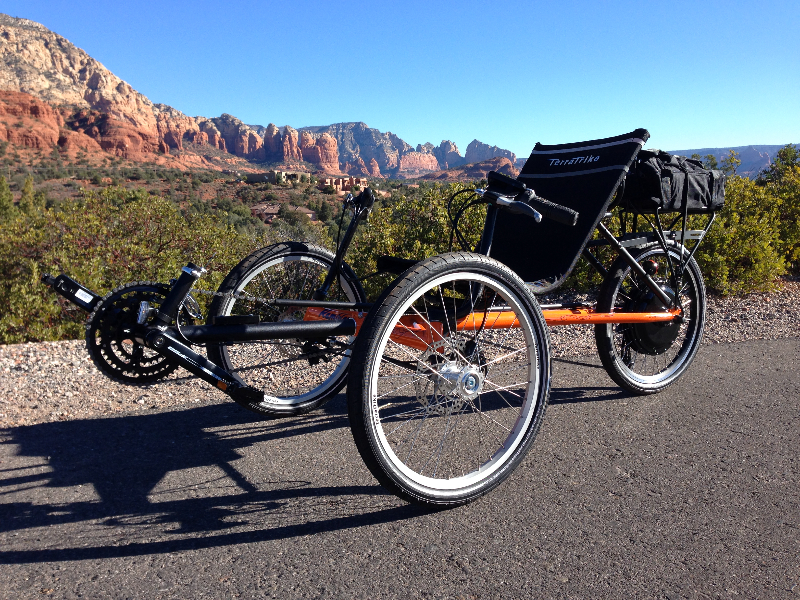 The TerraTrike Rambler with E-BikeKit ready to roll amongst the red rocks of Sedona, AZ. Drivetrain: 24 speed Microshift drivetrain with grip shifters. Brakeset: Alhonga mechanical disc brakes. Promax brake levers with locking feature for when the trike is parked come stock on the Rambler. The E-Bike Kit Tektro brake levers with electronic switches to turn the electric assist off when the brake levers are engaged are used in this conversion. 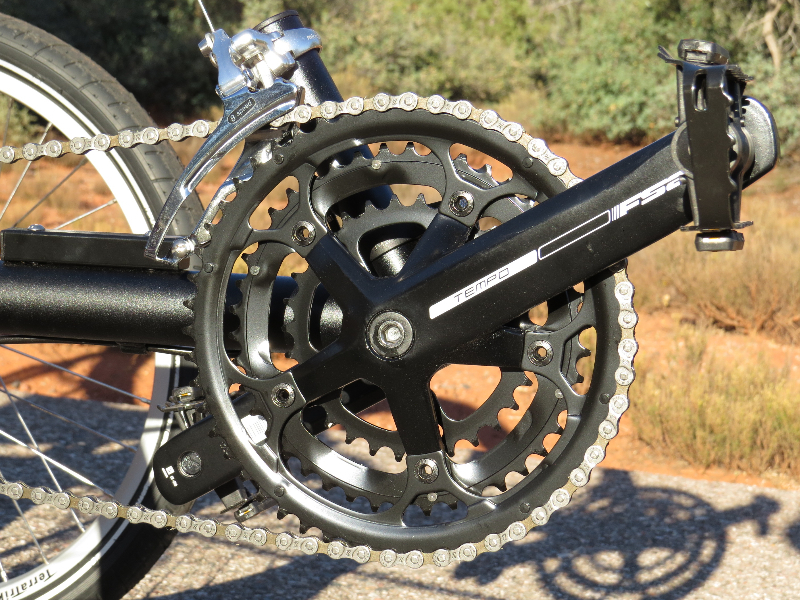 Cranks and Pedals: FSA Tempo cranks with 30/42/52t chainrings. Standard platform pedals. 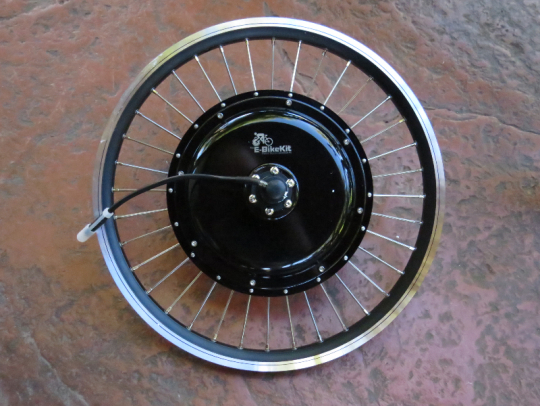 Tires: 20″ CST tires with reflective side strip. Accessories: Front and rear reflectors. Weight: 37 lbs. without kit. 76.6 lbs. with E-BikeKit with direct drive hub motor and 48V 9ah lead acid battery. 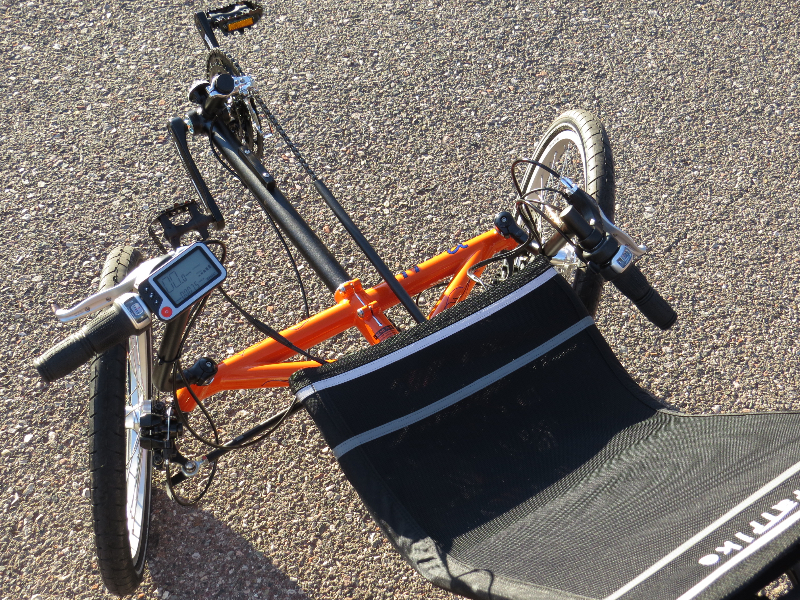 Total weight would be less with a geared hub motor and lithium battery. The lithium battery would increase the overall price. Price: $1,699 USD at the time of this review. Not including shipping. 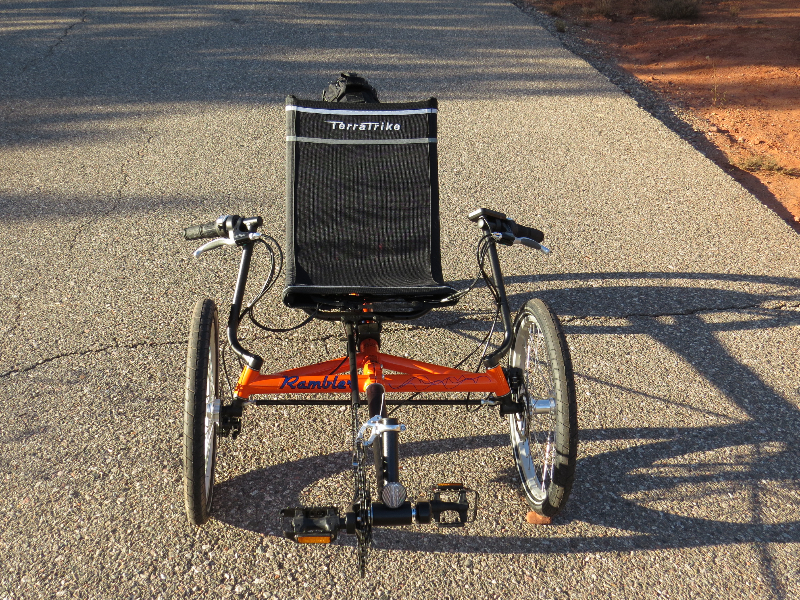 Here is a link to the specifications page of the TerraTrike Rambler. Motor: 500 watt (1,000 watt peak) direct drive rear hub motor. Disc brake compatible. 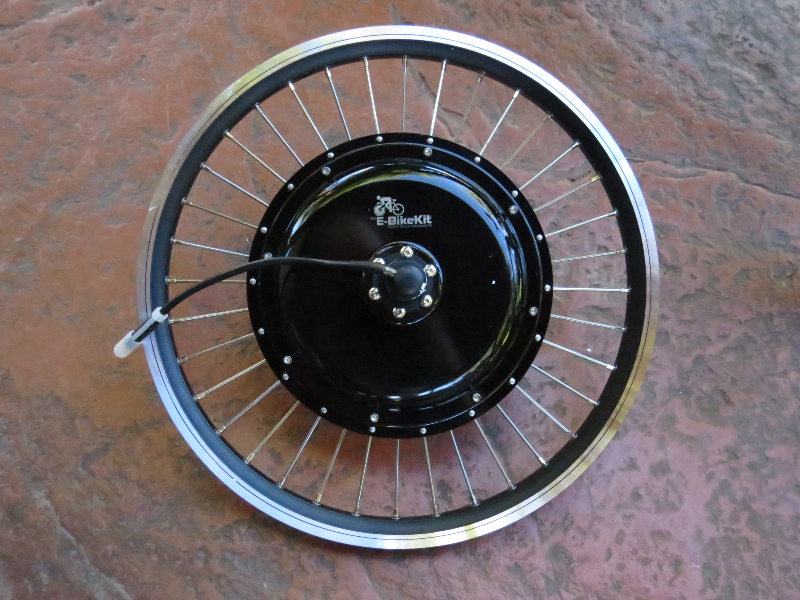 Hand built wheel (in the USA) with double wall rim & 12g stainless steel spokes. Includes Shimano 7 speed freewheel. 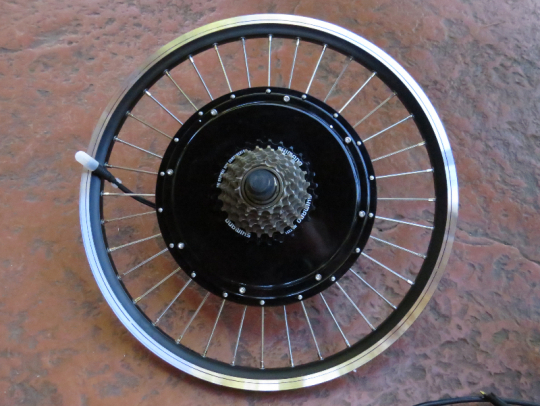 E-BikeKit will be offering 8 speed and 9 speed freewheel options soon. Battery: 48V 9ah lead acid battery. Includes canvas rack bag with velcro attachment straps. Controller: 36/48V compatible 22amp 12FET brushless motor controller. Assist Options: 5 speed levels that can be changed at the LCD display: 0-5mph, 5-10mph, 10-15mph, 15-20mph, 20-28mph. Throttle Options: Twist grip throttle or thumb throttle. Both included in kit. Display: LCD display: speed, distance (trip and overall), battery level, speed level (there are 5), and the energy draw from the battery (current). Backlight for riding at night. Brake Levers: E-BikeKit Tektro brake levers with electronic switches to turn the electric assist off when the brake levers are engaged. Price: $866 USD at the time of this review. Not including shipping. 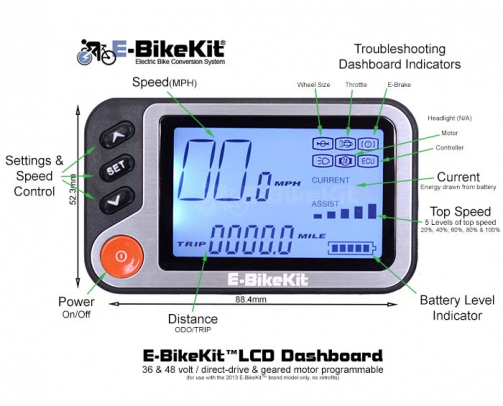 Here is a link to the specifications page of this E-BikeKit. 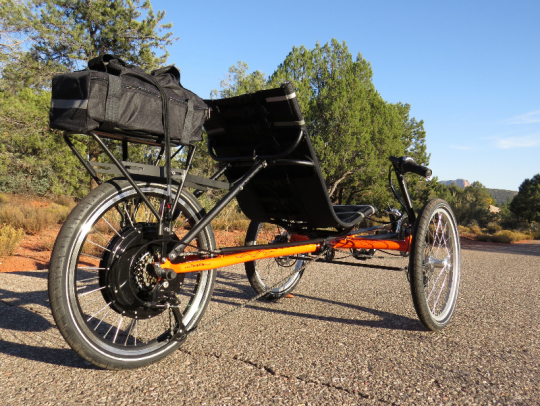 Now checkout part 2 of the TerraTrike Rambler with E-BikeKit review with info on the ride characteristics, the range test, pros, cons, and overall thoughts! 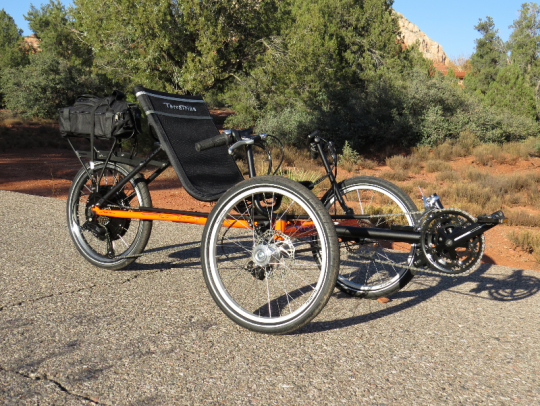 Pete, interesting that you provided this article on the same day I was notified that my BionX kit had arrived at my dealer for converting my TerraTrike Rover Tandem into an e-bike(trike). I’ll be taking my trike in tomorrow for the conversion. Maybe I can provide some additional feedback on my conversion project. Looking forward to the second part of your article. BTW, another trike manufacturer is offering a model this year with e-assist. Trident Trikes will have such a model available in their 2014 line-up. I’m not sure of their pricing, but I think they plan to price them at about the same figure your Rambler came in at. 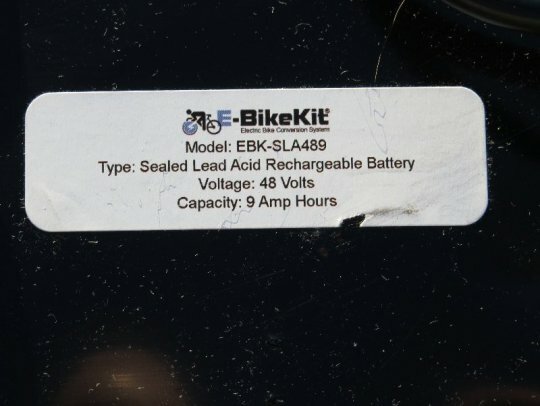 Roland, please give detailed information along with photos of your ebike (Trike). I am very interested in seeing the set up. Great review as always Pete. I have been keeping my eye on the Rambler trike for a while now in maybe selling my ebike for the rambler to convert it to an eTrike. I recently purchased a Trident Model E-Titon with a lithium battery for approx. $2700. 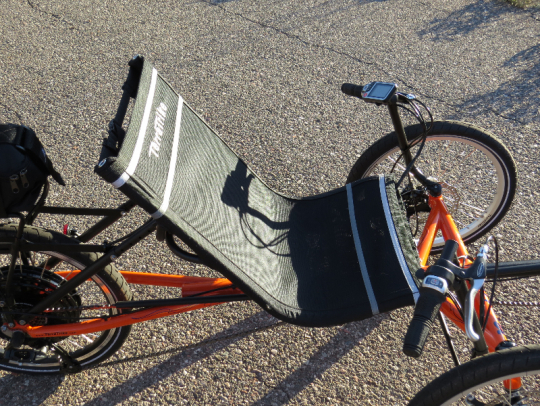 If not pedaling it can go up to 30-35 mph and has a range of up to 36 total miles. I have NOT gone this far without pedaling, so have not tested this claim.. So far, I really like the trike. 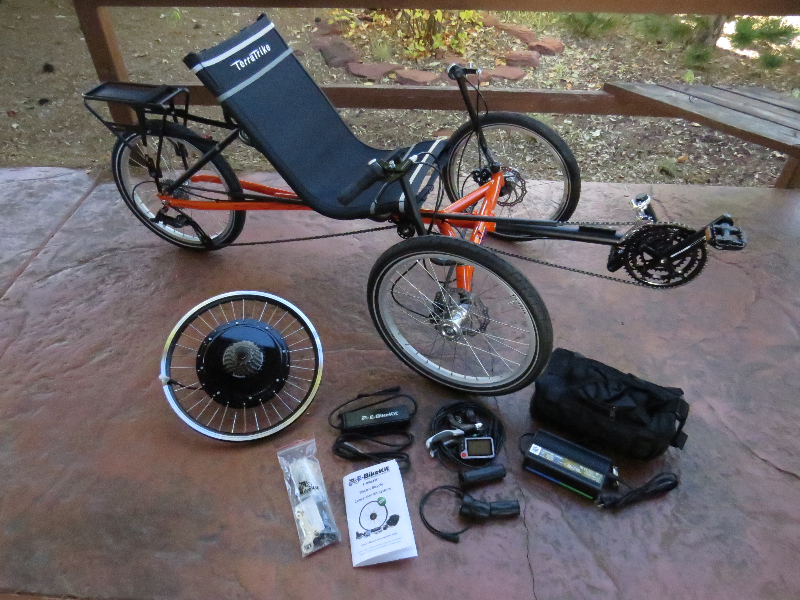 I also have an TourEasy recumbent and wondered if anyone has added an inexpensive Electric assist Kit. that could go on the rear tire to give it a small boast up hills ? ?